Since 1994 the Fondazione Mediterraneo carried out an intense publishing and multimedia activity in many languages in order to promote, testify and spread shared values of different cultures in the Greater Mediterranean. Hundreds of volumes have been published in different thematic series of books by Fondazione's publishing house Magma and by other qualified publishing houses. A non-profit work - Earnings shall be devoted to the "Maison de la Paix - Casa Universale delle Culture"
Michele Capasso retraces his experience as “architect of dialogue” at the head of the Fondazione Mediterraneo using the means of the description of a day passed in a hospital. It is a mix of sensations, emotions, reflections, experiences, memories and testimony in which there are set pages of a “Logbook” which the author has published over the years in newspapers and periodicals in the Euromediterranean countries. It is also the pathway of the author’s private life: engineer, painter, photographer, but more and more an architect of peace and culture in the Euromediterranean scene over the last twenty years. It is the tale of a singularly human experience, in a political and historical moment when the Mediterranean takes on, at the turn of the century, a strategic importance for peace and shared development. Fratricidal wars, forced migrations, ecological disasters, the absence of democracy and corruption are some of the causes which attack civil society. 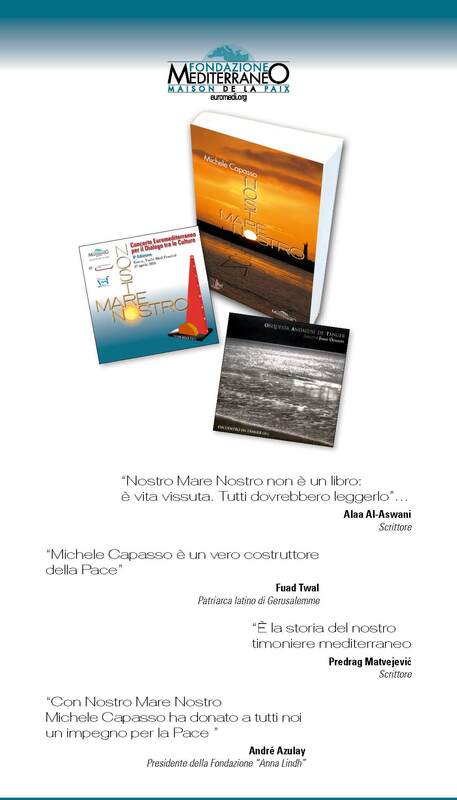 With these and others Michele Capasso acts by inviting people not to give up, as testified in the storied told in this book with a simple and efficient style: it is a mixture of stories and reports, where everything is rigorously true and corroborated in documents and images. The diary follows the day as a setting for 18 episodes in which the writing comes out of the main characters: the rubbish, the ambulance, the dog, the brothers of Gaza, the fat man, the funeral, the scalpel, the nurses, the probe, the parking attendant, the helicopter, the caress, the clandestine worker, the archive, the prostheses, the lawyer, the rainbow, the last kiss. The whole sense of the narration is to show, in the encounters of the global society, the ancient knowledge that human beings from the area of the Mediterranean have developed, in the connections with the land, its inhabitants and the sea, confronting adversities of the day without losing faith in tomorrow. The book is a collection of info-files of all the members of the Italian Network of the "Anna Lindh" Euromediterranean Foundation for the Dialogue between Cultures; it also shows activities and projects from 2005 to 2010.